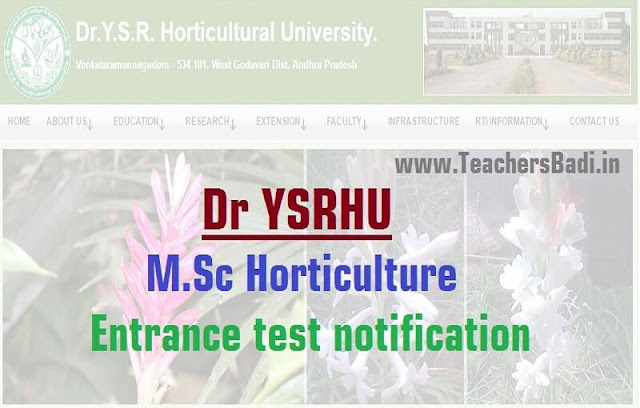 DrYSRHU M.Sc Horticulture Entrance test 2018-Dr YSR Horticultural University: Dr YSR Horticultural University has published the MSc Horticulture Admission 2018 notification and applications are invited for admission into Ph.D (Horticulture) with specialization in 1) Fruit Science, 2) Vegetable Science, 3) Floriculture & Landscape Architecture 4) Plantation, Spices, Medicinal and Aromatic Crops, 5) Post Harvest Technology, 6) Horticultural Plant Pathology and 7) Horticultural Entomology courses from candidates possessing B.Sc.(Hort. )/ B.Sc.(Hons.) Horticulture. online application form, Selection procedure, last date for apply, hall tickets, exam date, results, counselling dates and certificates verification dates are available at Dr YSRHU web portal. ప‌శ్చిమ‌గోదావ‌రి జిల్లాలోని డాక్ట‌ర్ వైఎస్ఆర్ హార్టిక‌ల్చ‌ర‌ల్ యూనివ‌ర్సిటీ 2018-19 విద్యా సంవ‌త్స‌రానికిగాను ఎంఎస్సీ ప్రోగ్రాముల్లో ప్ర‌వేశాల‌కు ద‌ర‌ఖాస్తులు కోరుతోంది. మొత్తం సీట్ల సంఖ్య‌: 48 (ఇందులో 36 సీట్ల‌కు స్టైపెండ్ ఇస్తారు). వీటితోపాటు ఇత‌ర రాష్ట్రాల కోటాలో 4 సీట్లు ఉన్నాయి. The selection shall be based on the weightage for previous academic record (B.Sc.-30%, Intermediate (10+2) - 10% and S.S.C - 10%) and performance in Entrance test (50%). General and OBC candidates with 50% or more than 50% marks in entrance test are eligible for interview/counseling which is relaxable in case of SC/ST candidates to the extent of seats reserved for them. The entrance test will be objective type for 200 marks covering all relevant subjects prescribed for the concerned Bachelor degree requirements of this University. Every downloaded online application should accompany DD drawn in favour of “Comptroller, Dr.YSRHU, payable at Tadepalligudem” for Rs.500/- (Rupees Five hundred only) for M.Sc.(Hort.) for general category and in case of SC/ ST/PHC candidates Rs.250/- respectively along with two self addressed envelopes with pin code affixing postage stamps of Rs.5/- on each. Applications duly filled in together with Demand Draft and all the prescribed certificates should be sent to “The Registrar, Dr.Y.S.R. Horticultural University, Administrative Office, Venkataramannagudem, Near Tadepalligudem, 534101, West Godavari District on or before ....2018.” All the eligible candidates in P.G.Entrance Test should bring their original certificates at the time of counseling. 2. Date, Time and Venue of Entrance Test for M.Sc.(Hort. ): 07-08-2018 by 10:00 AM to 12:00 Noon at Horticultural College & Research Institute, Venkataramannagudem, West Godavari District. 3. Date & Time of Counseling for qualified candidates : 08-08-2018 by 10:00 AM at Horticultural College & Research Institute, Venkataramannagudem, West Godavari District.